Herbie had to investigate of course while I took the pictures, so used him as a handy book holder. 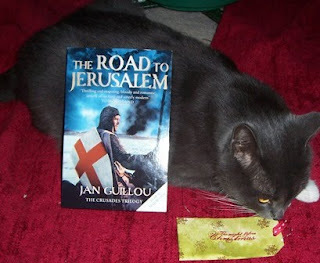 Zee from Notes From The North sent me a historical fiction novel by a Swedish author which takes place in 12th century Sweden - The Road to Jerusalem by Jan Guilou. How cool is that!!!! 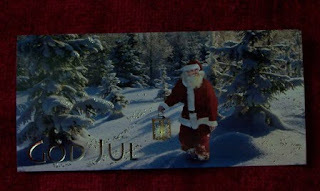 Along with the book, a beautiful christmas bookmark and a card. Thank you so much Zee. I look forward to reading it. Oh I'm glad it arrived! I hope you enjoy the book. I hope it works for your historic fiction challenge. What a lovely gift! Enjoy your new read! Wow, what a great gift from across the sea! I love HF, can't wait to hear how you liked the book.